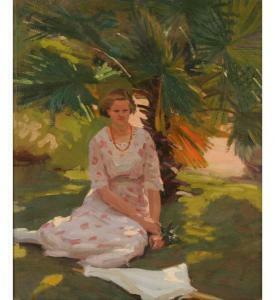 Find artworks, auction results, sale prices and pictures of Paul Turner Sargent at auctions worldwide. 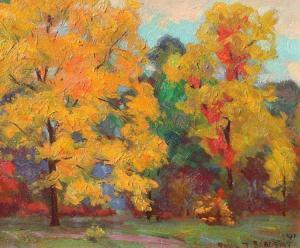 SARGENT, Paul, (American, 1880-1946): Autumnal Landscape, Oil/Canvas Board, 10'' x 12'', signed lower right, dated 1941, also signed and dated verso, original carved and gilded frame, 13.5'' x 15.5''. Frame shows minor wear, sold as is. Descriptions provided in both printed and on-line catalogs may not include condition reports. The absence of a condition statement does not imply that the lot is in perfect condition or free from normal wear and imperfections related to age and use. Bidders are strongly encouraged to satisfy any questions as to condition by personal inspection, or by either telephone or e-mail condition report requests prior to placing a bid on any lots in which they have interest. A bid placed by you or your assigns guarantees to Burchard Galleries that you are satisfied with the item's condition prior to placing your bid and that you are bidding on that item in "As Is" condition. We thank you and good luck to all bidders! Sargent was a landscape painter from Illinois. He worked in BrownCounty, Indiana at the encouragement of Adolph Shulz, and was acharter member of the Brown County Artist Association. 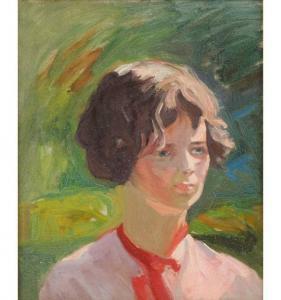 He alsoexhibited at the Hoosier Salon for over twenty years. 23 3/4" x 19 3/4"
A statement of "Very good condition" means, that in our opinion,there are no significant damages and there has been norepair. Any condition statement is given as a courtesy to the client. Weare offering our professional opinion. We attempt to submitcondition reports in the description. However, the absence of acondition statement does not imply that the lot is in perfectcondition or completely free from wear and tear, imperfections orthe effects of aging. Antique Helper, Inc., et al shall have noresponsibility for any error or omission regarding an item'scondition. 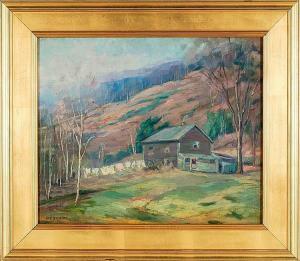 Paul Turner Sargent, 1880-1946, Charlestown, IL, oil on artistboard of a country home in the mountains, signed lower left "PTSargent," 16.5" x 19.75 inches, newly framed. Provenance: ASouthern collection. 16 3/4" x 13 3/4"